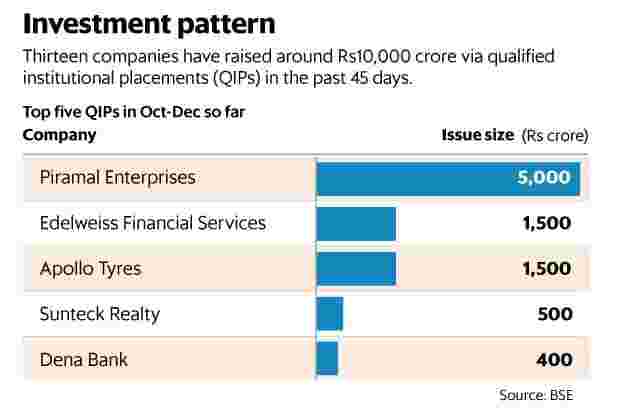 Mumbai: The December quarter has seen a rush of qualified institutional placements (QIPs) hitting the market, with 13 companies raising around Rs10,000 crore in the past 45 days through this route. The level of activity in the current quarter is in contrast to the preceding nine months, which saw just 20 companies raising funds through QIPs. Listed companies can sell shares and convertible debentures to qualified institutional buyers through the QIP process. The surge is linked to the buoyant secondary markets and the liquidity that institutional investors are sitting on, market experts say. The combination of these two factors have made QIPs the instrument of choice for listed companies that are looking to raise capital. “QIP is a very effective instrument for listed companies to raise capital in a buoyant market, quickly and at a low cost. Companies are able to price the issues at close to the market price, without having to announce the price in advance. These features have made QIPs the most efficient route of follow-on fundraising for listed companies," said Prithvi Haldea, chairman of Prime Database group, a primary market tracker. There has also been a sharp decline in rights issues or follow-on public offerings, the other similar fundraising instruments available for listed companies, he added. The QIP route is also attractive for institutional investors, added Haldea. “QIPs are priced at a discount to the market price, so it makes a good opportunity for institutional investors to come in and get big allotments, which they cannot get easily from the market. So institutional investors, especially domestic institutions, which are sitting on huge piles of money, for them this is a good way to invest money," he said. The liquidity in the market has meant that smaller companies even from non-financial services sectors have been able to tap the markets, said experts. Companies from manufacturing, specialty chemicals, logistics and real estate raised funds by selling shares to institutional investors in the December quarter, although banking and financials companies dominated the activity from a value perspective. “Apollo Tyres and Interglobe Aviation, leading companies in their respective industries, have raised funds from institutional investors in the last couple of months. Smaller companies such as Navkar Corp. in the logistics sectors, and Sunteck Realty have shown that smaller companies with proven businesses are able to access the public markets as well," said Prashant Gupta, partner and national practice head, capital markets at law firm Shardul Amarchand Mangaldas. Other companies that tapped the market through the QIP route include specialty chemicals companies Camlin Fine Sciences Ltd, Bodal Chemicals Ltd and Nitin Spinners Ltd.
Financial services companies that raised funds in this period include Muthoot Capital Services Ltd, Edelweiss Financial Services Ltd, Dena Bank Ltd and Satin Creditcare Ltd.
Gupta said that investors continue to display conviction in the stock markets, despite the current level at which the markets are trading, which augurs well for QIP activity. “We believe there continues to be investor interest in the Indian capital markets despite the Sensex/Nifty trading close to their all-time highs. This is being driven both by liquidity in the market as well the belief that there continue to be several relatively well priced stocks in the market despite the indices trading higher in the last couple of months," he said.